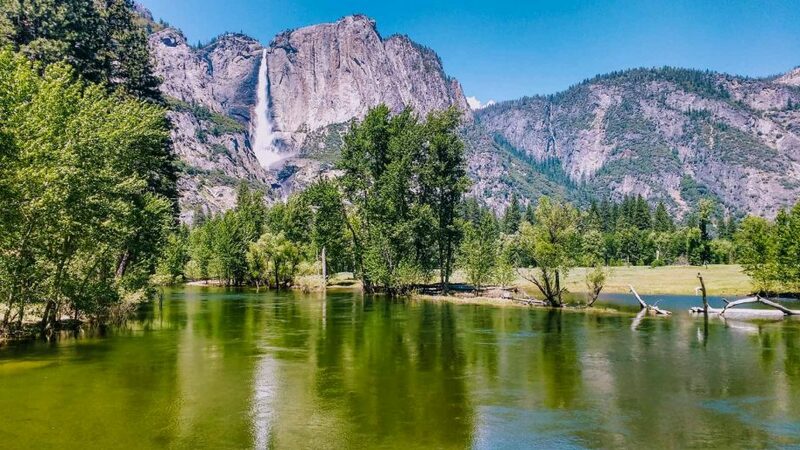 If you and your family only have a long weekend to explore the beauty of Yosemite National Park and you're looking to experience the park with your own two feet, this is the trip for you! Over three action-packed days, our Yosemite guides will show you all the highlights of the Yosemite frontcountry. 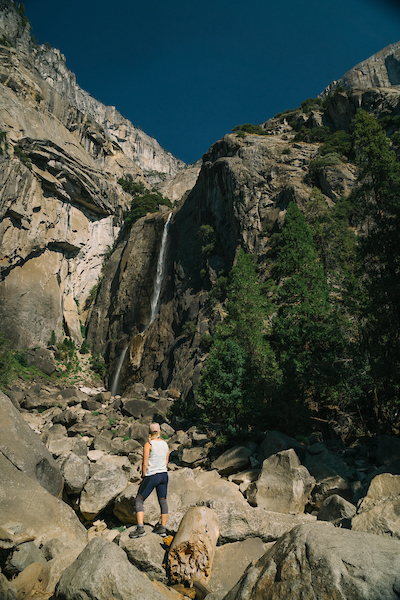 On day one you’ll hike the infamous Mist Trail and get acquainted with the AOA basecamp with your fellow adventurers. On day two you’ll hike the Four Mile Trail (name of trail is misleading – you’ll actually be hiking 9-10 miles on this day!) 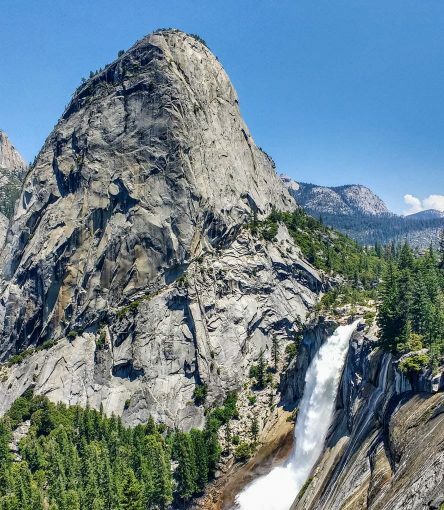 to see panoramic views of the main icons of Yosemite from Glacier Point including the Valley, El Capitan, Half Dome, and more. 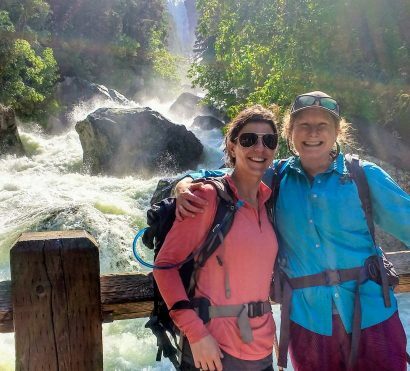 We save the best for last on the third day, with a hike on the Yosemite Falls trail. Trip Start: Meets at the Half Dome Village Parking Lot at 10am on Day 1. Trip End: Ends at the Half Dome Village Parking Lot between 2-4pm on Day 3. 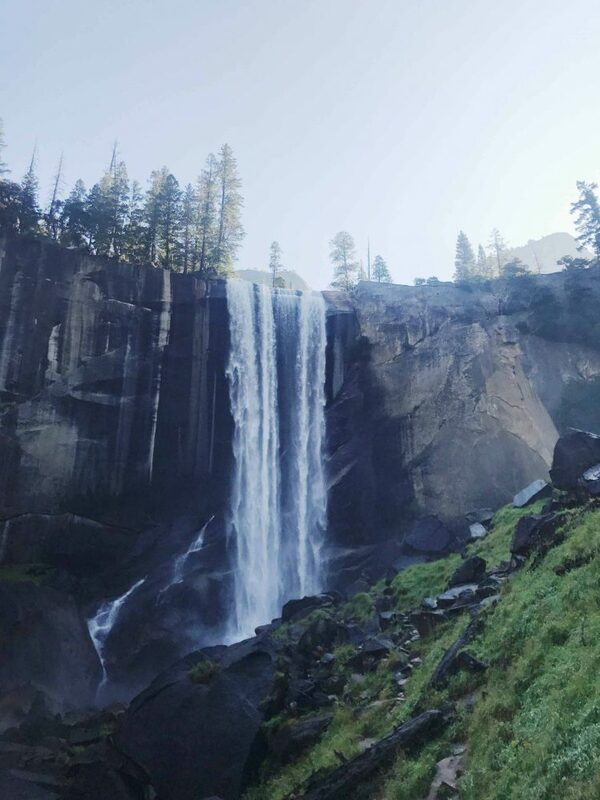 DAY 1: Meet Your Group and Hike the Mist Trail! Today, after a hearty breakfast, we’re going to earn our panoramic views by hiking the challenging Four Mile Trail. 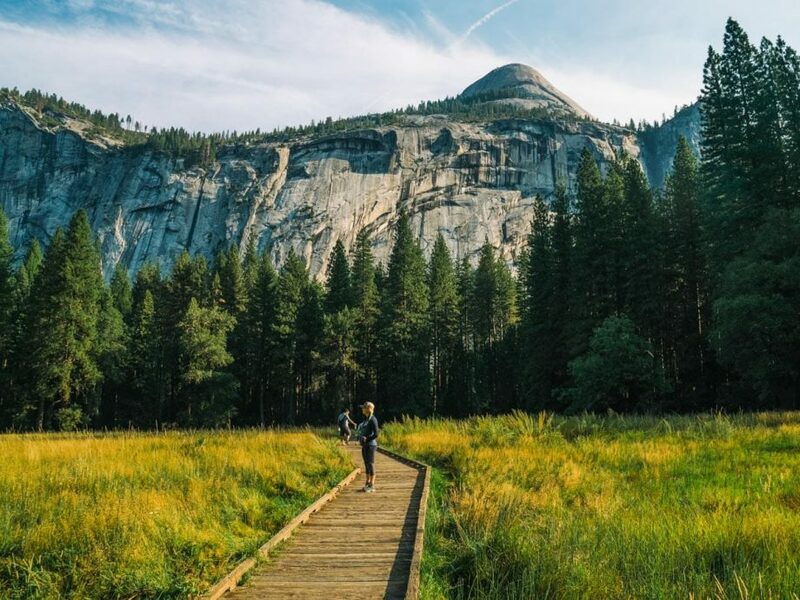 This trail climbs straight up from the valley floor and provides incredible postcard-worthy views of Yosemite Valley, Yosemite Falls, El Capitan, and Half Dome. Eventually we reach Glacier Point where we’ll stand where John Muir and Theodore Roosevelt once stood. Some people visit Yosemite just to come to Glacier Point. We’ll take a breather here and enjoy the views before retracing our steps back to our campground for one more night of Yosemite camping. After we fuel up with a guide prepared breakfast and break camp, we’ll head to one of Yosemite’s oldest historic trails. 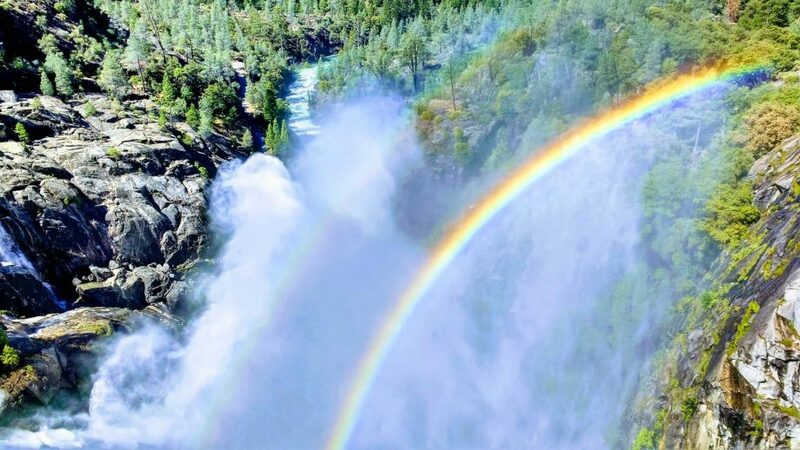 The Yosemite Falls hike rises 2,425 feet above the valley floor to the top of one of North America’s tallest waterfalls. 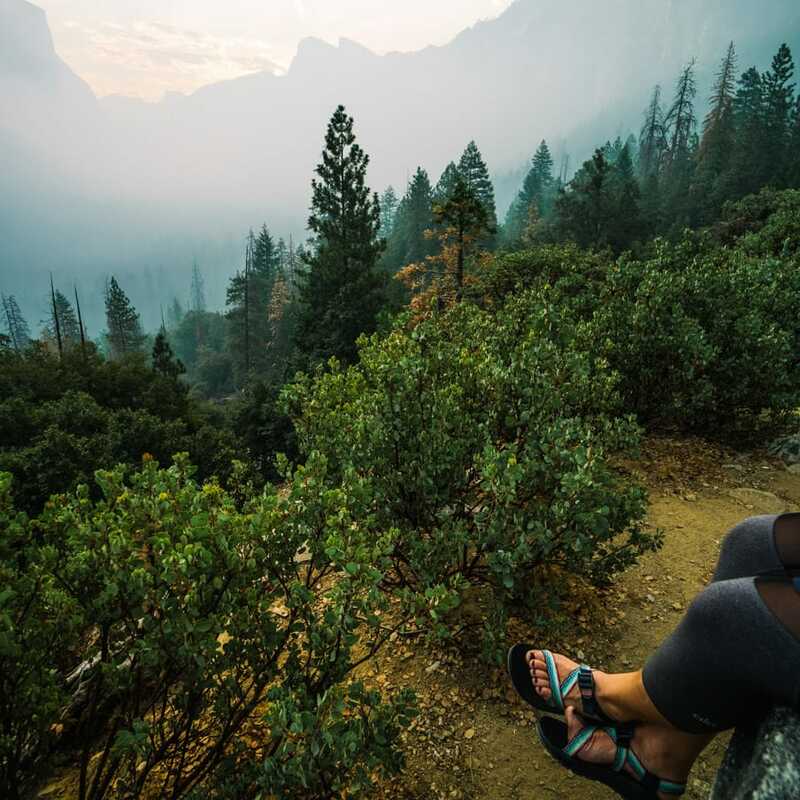 The steep, thrilling trail offers spectacular views of Yosemite Valley, Half Dome, Sentinel Rock, Upper Yosemite Falls, and more! Our turnaround point depends on timing (and how our muscles have recovered from yesterday’s adventure). Regardless of when we return to the valley floor, the challenge and incredible views of Yosemite National Park make it the perfect way to end our journey together. We’ll return to Half Dome Village between 2-4pm where we’ll make plans for our next adventure together before parting ways. 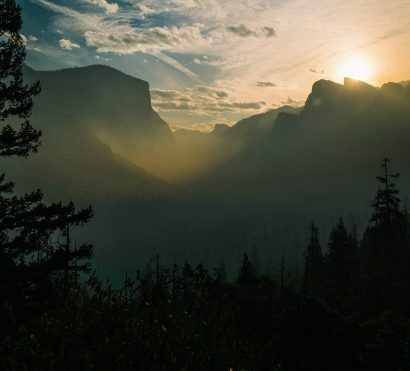 Cell Service & Electricity: While camping in Yosemite National park, cell service can be limited. You should expect it to be unreliable during this trip. There will be limited access to electrical outlets. Bring a portable phone charger so you’re not reliant on this power source. Showers: There are hot showers available on this trip, but they require that a walk of about 15 minutes from the campground. 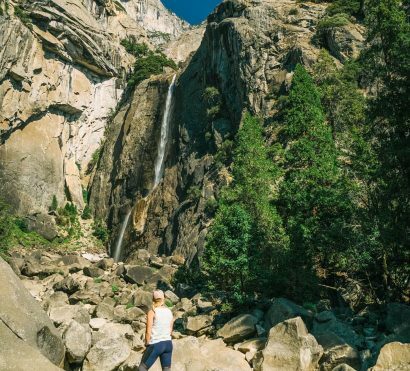 Yosemite is a magical destination, and you’re not the only one who thinks so. On weekends from spring to fall, the park can be very busy and it’s likely we will experience some traffic while driving to/from trailheads in the valley. Black bears in Yosemite have become accustomed to visitors and they often wander Yosemite Valley in search of food. Because of this, all park visitors must take mandatory precautions to lock up all “smellable” items from hand lotion to snacks in bear-proof cans. This keeps the bears and the visitors safe. It can be a challenge, but our guides will help you make sure your campsite is bearproof.